THEY SAY YOU never stop learning and, when pressed, even the most experienced ‘old dog’ caravanner will confess to confronting new challenges. 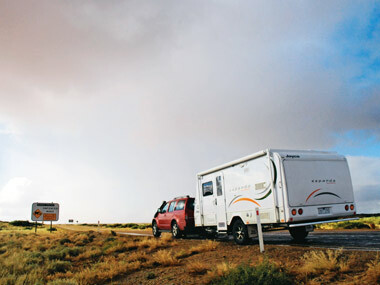 Testing caravans accelerates this learning curve, because unlike most vanners, who master the idiosyncrasies of their rigs over many years, you set out on each trip with unfamiliar equipment. Such was the five-week, 11,000km Gibb River Road trip my wife Wendy and I took in May and June this year. From the moment we dropped our 2011 Jayco Expanda 16.49-3 OB test van onto the towball of our borrowed Nissan Pathfinder ST-L 2.5L diesel, we had issues to overcome. With a Tare of around 1560kg in Outback spec, the 4.9m (16ft) Expanda was well within the braked trailer capabilities of the compact Nissan. And the Pathfinder, with its separate ladder-frame chassis, well-protected underbody and competent 4WD system, was certainly tough enough for one of Australia’s most feared outback touring roads. But while the Expanda’s ball weight of less than 200kg (laden) was well below the Pathfinder’s limit, it caused the 4WD’s tail to droop, and greatly reduced ground clearance. Like many other manufacturers of 4WDs with independent rear suspension, Nissan advises against load-levelling devices. This left us nowhere to go without fitting heavier-duty, after-market rear coil springs or pump-up shock absorbers, neither of which was possible with the Pathfinder on test in its standard form. But we made it through with no real problems, the rig remaining stable at bitumen speeds up to 130km/h. But the A-frame of the Expanda regularly scraped on creek crossings, eventually bending the thick steel plate that protects the hand-brake mechanism. LESSON: Ensure you match your tow vehicle and van correctly before embarking on a long trip. Ideally, you should take the rig away for a weekend in advance. If you find a problem, check with the manufacturer of your vehicle or van for suggestions that will not void your warranty or impact safety. Caravan manufacturers usually go to great lengths to get the balance of their vehicles right, which is why you see spare tyres and jerry cans mounted at the rear of some vans and on the A-frame of others. All towing hitches have a load rating which can easily be exceeded, and can potentially lead to stress fractures on your tow vehicle if you add additional spare wheels, fuel and water containers, or overload your van’s front boot with heavy items. LESSON: The principles of correct loading are simple. Start with the assumption the manufacturer of your van got it right, then add extra weight in even proportions either side of its axle, while ensuring the total weight of the rig does not exceed the van’s ATM. When travelling into areas where water is scarce or undrinkable, it’s tempting to top up your tanks before leaving home. But consider the extra stress on your van of carrying those extra kilograms, not to mention the effect on your fuel consumption. 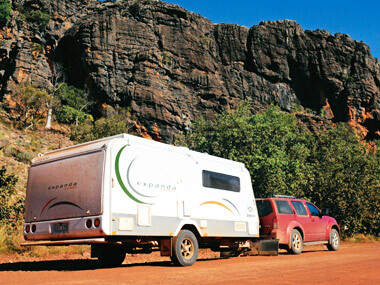 LESSON: We found the best solution was to carry plenty of safe drinking water in separate 20L containers, and to put the minimum amount of water in our Expanda’s tanks when the opportunity arose at caravan parks. To travel with this philosophy, you need to carry a supply of sterilising tablets and be prepared to boil the water in your tanks before drinking. Also, if you have twin tanks, make sure all your water is not stored in the rear tank, which will upset your rig’s towing stability. If you are travelling one of Australia’s major outback highways, you really need to do your homework and carry more than enough fuel. We learned our lesson on the Tanami Track during the final offroad leg of our Kimberley trip. With the closure of the Rabbit Flat Roadhouse in January 2011, the fuel stops between Halls Creek and Alice Springs were 170km, 439km, 152km and 136km apart, in that order. However, even our Hema map didn’t tell us the fuel pumps in the Aboriginal communities of Billiluna and Yuendumu were hard to find and horrendously expensive – setting our trip record of $2.60 per litre at Billiluna. We instead emptied our 20L jerry can into the Pathfinder’s tank at Billiluna and only topped up at the outrageous rate, feeling confident we’d make it to Yuendumu, 439km away. LESSON: If you have a vehicle with a big reserve tank – like a Toyota LandCruiser or Prado –you should have plenty of range. But if you are towing with a Nissan Pathfinder diesel like we were, the standard 80L tank will probably not be enough, despite what the map tells you. Alcohol abuse in remote Aboriginal communities has led to major restrictions being applied, and travellers seeking a simple sundowner can suffer as a result. For example, you can no longer buy cask wine at Coles in Alice Springs, and full strength beer and wine is only available for two hours a day, with a wine limit of two bottles per person, in Kununurra. While limits were a little more liberal in Derby, the prices for bottled wine were three times what you’d pay at a mainstream capital city outlet. LESSON: Wine casks are good travellers and represent a low centre of gravity when packed low in your caravan. Stock up in advance, but do your homework and don’t bring too much if you are planning to visit remote indigenous communities. We like a healthy and varied diet, which means fresh fruit, vegetables and herbs. But our trip to the Kimberley caused us to do a major re-think. Heading from Melbourne, we passed in and out of a number of fruit fly zones in SA, NT and WA. And in case you think these are toothless tigers, be warned: the one at the WA border, just short of Kununurra, would not have been out of place on the Sino-Russian border. The other problem with carrying fresh vegetables and herbs is that they don’t like over-refrigeration, so if your fridge is set at the right temperature to chill drinks, it will probably ruin your herbs. LESSON: Research the fruit fly zones and shop locally for fresh fruit, vegetables and herbs in small quantities. Carry dry spices to flavour your food. Keeping stones from marking your caravan, damaging its underside and potentially shattering windows is a science to which many in the towing industry have applied their talents. Given our Expanda was a new van, Jayco specifically asked us not to fit any after-market stone protection. However, knowing the roads we were planning to travel, we borrowed a set of Rock Tamer mudflaps from RV Towing Solutions to minimise damage to the Expanda’s façade. The Rock Tamers got a hammering, sparing the Expanda from the worst the Gibb River Road, and Oodnadatta and Tanami tracks could throw at it. But even so, a number of missiles managed to get past its guard. Looking at where they struck, it was obvious the drooping drawbar was one of the culprits, as it put more of the Expanda in the firing line. Then there was the damage underneath. The sharper rocks on the final section of the Oodnadatta Track knocked out the Expanda’s plastic drainage pipes, which had to be replaced in Alice Springs. LESSON 1: After parting with $250 for repairs, we learned a trick. Wrap some carpet offcuts around any vulnerable components and secure them with cable ties for a simple, inexpensive solution. The other vulnerable component on the Expanda was the exposed copper plumbing for the twin 9kg front-mounted gas cylinders. Not only were they sitting targets for stones, but there was also the potential of fracturing from the constant vibration from corrugations. LESSON 2: Invest in proper stone protection for your caravan before setting off on an inland trip, ensuring this extends to exposed areas underneath. Replace your rigid gas cylinder plumbing with flexible, braided lines if it is exposed. Speed, stone damage and punctures are quite often related. Take the advice of those who drive these roads regularly: do not travel with your rig on unsealed roads at speeds of more than 80km/h. Corrugations on many roads need to be attacked at one of two speeds: painfully slow, usually less than 20km/h; or upwards of 65km/h, at which your rig planes over the top of the ridges. The problem with higher speeds is that if you have to slow down quickly for a corner, a grid or obstacle, the braking will use up virtually all your spring or shock absorber travel under compression and you will be transferring the full impact to the structure of your tow vehicle, or your van’s chassis. LESSON: Keep your speed down on the open unsealed road, but keep it up (within limits) on corrugations. We lost three jars of Nescafe when their lids unscrewed on the corrugations of the Gibb River Road. The worst part was getting it out of the cupboards. LESSON: I’m tempted to say “drink real coffee”. But if you like instant, as my wife does, then decant it into a more robust screw-top jar, or duct-tape the lid on. Along with Nescafe jars, the D-shackles that connect your safety chains to the towbar also have the unhelpful habit of unscrewing on corrugations. We lost four on the Tanami Track before we pulled out the pliers and nipped the last one tight. 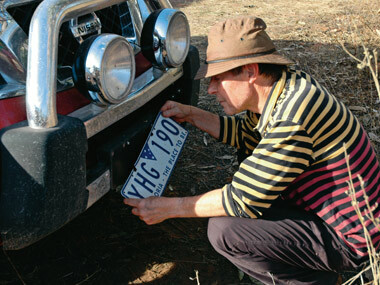 If you apply all these lessons, your next outback journey will be a lot more pleasant. By then, you’ll be ready to read chapter two of this story and discover what we have learnt on our next trip. 1. When travelling on dusty roads, seal all external vents with duct tape or, if you want to open and close them at will, use Velcro to attach removable vinyl flaps to these areas. Also, block off the interior vents if you can, as a double measure. 2. Spend an hour or two going around the inside of your drawers and cupboards with a sealant gun. Some mass produced caravans can be improved in this area. 3. If you have a dust hatch that pressurises your van’s interior to keep dust out as you travel, don’t forget to open it. 4. Make sure all windows and hatches are fully closed and their locks are applied. 1. 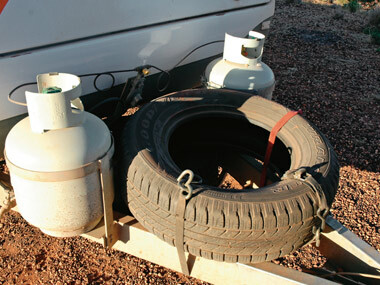 When all tyres are cold at the start of the day, inflate your tow vehicle’s tyres to the maximum recommended for a fully-loaded vehicle when driving on the bitumen and set your (single-axle) caravan’s tyre pressures to 35psi. Remember, if it’s hot these pressures will rise by 6-8psi during the day. 2. When you are leaving the bitumen and the road is rough or corrugated, reduce your tyre pressure by around 25 per cent. While on the bitumen you can run the tyre pressure when hot right up to the manufacturer’s recommended maximum. This will not allow the tyre carcass to flex on rough or stony surfaces, though, so you would more likely get a puncture. The more worn your tyres, the more vulnerable the carcass is to stone damage, because you have no tread depth to protect you. The other bonus of lowering pressures offroad is that fewer shocks are transmitted to your rig, making the ride more comfortable. 3. If you hit sand, knock another 25 per cent off the pressures. 4. Reinflate to the correct pressures for the surface once the road improves, or travel at slower speeds until you can. Share your own tips below.